I know we have all seen her work before, but I just can't help myself from admiring it every time I open my inspiration folder. I'm big into color, if you haven't already noticed, and I think she pulls together so many amazing colors and patterns into one room that it makes me wish I could be half as good as her one day. Take this bedroom for example. 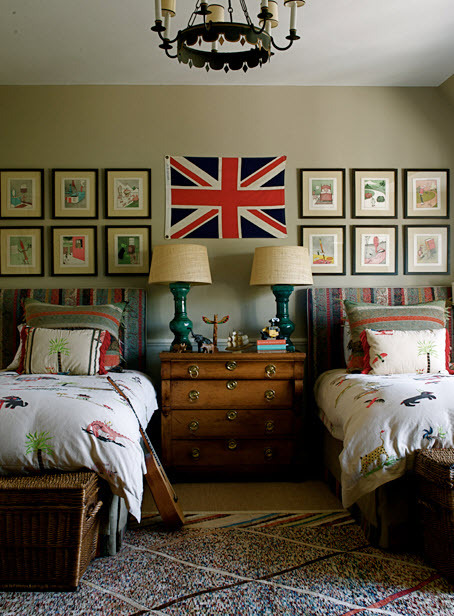 The combo of the rugs (looks like they are layered, but it could just be one rug with a border), duvet, pillows, headboard, flag, artwork and those lamps is crazy cool. And I love how she used the same fabric for the headboard and pillows just rotating the fabric on those pillows so the stripes are horizontal. It looks like each piece in this room was acquired over time and just came together in all its perfection. Maybe it was the orange throw that drew me in, but whatever it is I really like how very different styles come together for a cohesive look. It looks layered and unfussy- interesting to look at and so not boring. The rug is my favorite feature in this room. All the other colors from the flowers, to the pillows and the vases at the very top of this built in bookcase are pulled from that rug. I'm not the designer so I don't know if she found the rug first and worked from there or if it was the last thing to come into the room- either way everything works and I love it. There is so much to look at here I don't know where to start. But even though there is alot going on here I don't find it crazy-headache-busy at all. The round coffee table breaks up the sharp edges of the chairs, sofa, fireplace and bookcase. I love how it is painted a bright yellow- to me it brings in a young modern feel with all the other rather traditional pieces, while also pulling the yellow color from the curtains. 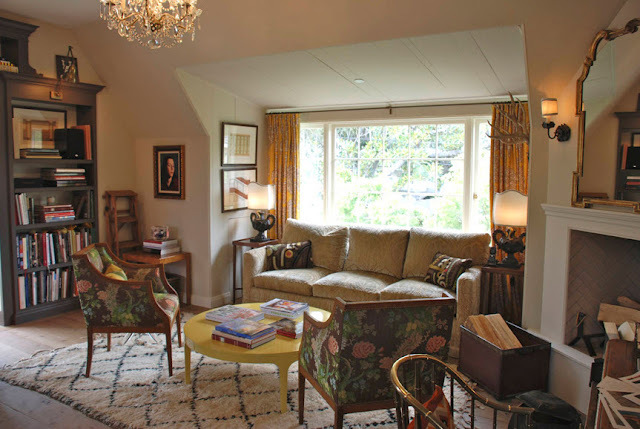 Lets not forget the herringbone pattern in the fireplace- just another detail I love from a long list of them from this room. These are just a few of my favorites from her portfolio. To see lots more eye candy for yourself go here. the 2nd pic has been my screensaver at work for some time! i love her work too. the way she layers everything & mixes pattern is amazing. love it! 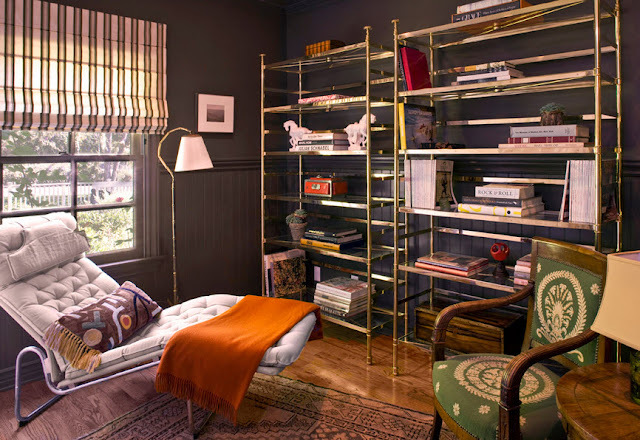 You would love "flip" a book that I have that shows one how to layer a room. I love all the layers that kristin shares. Like "eye" candy there is something everywhere to look at! Texture, color, and so livable! Patricia- I just ordered that book- I can't wait to get it now!! I love her style. This is what I want my home to look like. Not decorated but layered over time and fabulous!! It takes real talent to layer and not look cluttered and crazy....what is the name of the book Patricia is talking about? Sounds fantastic!! wow. i just love her style. that first room is my fave. wow! love all of these! BEYOND cool is that first image. I agree, the overall combination of all of the different patterns and layering is amazing! I think what I love most her style is that's its attainable. just a little hunting and it can be recreated so easily. 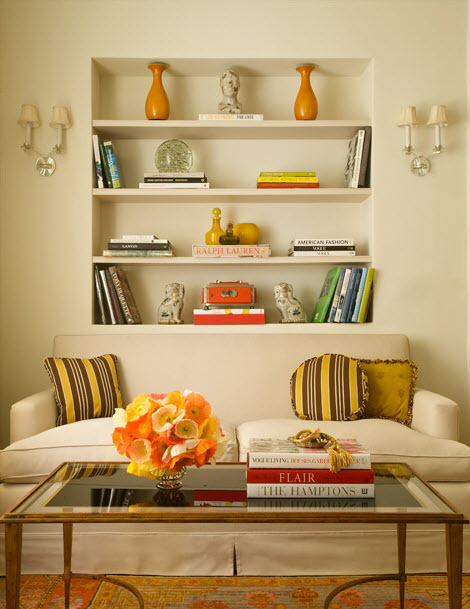 yes,love the pop of color & I like it that she makes everything balanced! I love the pops of orange, beautiful. That first room is looks so cozy, sign me up! Oh, and the second pic is my fav! Noticing all touches of brass these days, and she rocks it, fo sho! All really so great, that first image is speaking to me...maybe b/c I am just a sucker for the British flag, wherever and whenever I see it, it always appeals to me. New to her designs, thanks for the intro! the book i think you may be talking about is flip for decorating by elizabeth mayhew--i have it and love it!